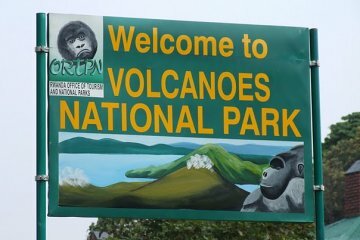 Rwanda’s Volcanoes National Park (Parc National Des Volcans) has become THE place to see mountain gorillas. But visiting on a budget can be tricky. THE PARK WAS ESTABLISHED in 1925 (Africa’s first) to protect the gorillas from poachers and was made famous in the 1960s by the tireless work and advocacy of Dian Fossey. 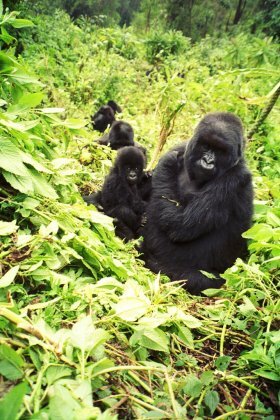 Today, the Rwanda Tourism Board offers several options for tracking gorillas and exploring the park. The highlight of the park is undoubtedly the gorillas themselves — however, the experience comes with a price. 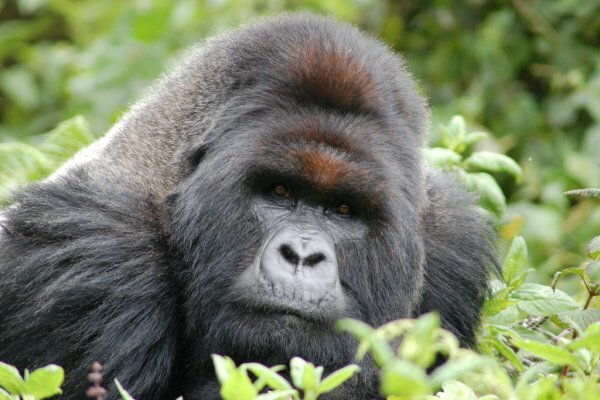 Standard fare is to pay $500 for an hour of observing and photographing gorillas in the wild. What the tourism board likes to keep on the mum is the fact that there are other much more economical activities. Park rangers will take visitors on one- and two-day treks to summit extinct volcanoes, on guided walks to Dian Fossey’s camp and tomb, and even on tracking expeditions to find the Golden Monkey. None of these cost more than $75, and since you’ll be in the heart of gorilla territory, the chance of spotting a family group is high. The park is located in the village of Kinigi, about 25 minutes by motorbike from Ruhengeri. While Ruhengeri is a bustling market town and a good place to stock up on snacks and cash, it has little else to offer, so unless you arrive late and need a place for the night, I’d suggest moving on to Kinigi. The Kinigi Guest House ($10-$85) is at the foot of the Virunga Mountains and just down the dirt road from park headquarters, making for easy day-time exploration and convenient early-morning departures. Accommodations range from pitching your own tent, to 4 person dorms, to luxury suites, and a simple breakfast is included. Also, nearly all of the proceeds generated by the guesthouse are used to pay school fees for orphaned children and to support community development projects. Reservations are recommended, but as long as you’re flexible the staff can usually find a place for you to stay. The village center of Kinigi consists of a few small shops and a food stall or two. Kids kick around balls made from plastic bags and string, and adults walk to and from the fields, chatting idly. Take a seat on one of the brightly colored plastic chairs and enjoy whatever happens to be on menu. That’ll most likely be ugali (maize flour dough) with greens and boiled plantains, and beans too if you’re lucky. Most guesthouses also have their own restaurants, but eating in town gives you a better sense of what daily life is like in Kinigi. A solid $75 option is to trek Mount Bisoke (3,711m) on a long, strenuous day hike. It’s tough, but if you go in knowing that and have a moderate level of physical ability, you’ll be fine. The trek follows trails created by buffalo — no switchbacks here, only steep inclines. During the rainy seasons (Mar-May, Oct-Nov), you can expect a lot of standing water and mud, so be sure to dress in layers and wear decent shoes. Rangers have a tendency to downplay the length and difficulty of this hike — when they say it’s only 4 hours, they really mean 8. Bring food! This is gorilla territory, so there’s a very good chance you’ll encounter a family group at some point during the day. However, because you haven’t purchased a permit, taking photos is a big no-no. Your guide will kindly remind you of this should you spot the animals — take this seriously, as guides can lose their jobs over infractions. The turnaround point is at the summit of Mt. 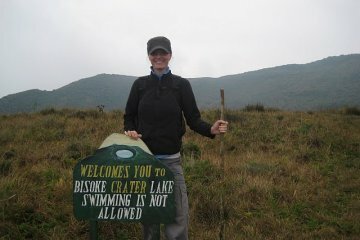 Bisoke and its crater lake, with 360-degree views of green but still very active volcanic peaks. Just a few years ago, Mount Nyiragongo erupted, spilling molten rock through nearby towns and villages and devastating the region. Whichever park activity you sign up for, you’ll meet at headquarters at 7am to pay your fees and listen to a quick orientation lecture. The Mount Bisoke trek starts at the base of the volcano, about 45 minutes by car from headquarters. It’s expected that you have your own transportation to the trail head, but independent travelers can usually find an open seat in one of the vehicles leaving from the park. Just ask around. Yeah, it’s a bummer not getting photos of the gorillas. But try this instead: buddy up to your bunk mates back at the guesthouse (the ones who paid the $500 for the photo expedition) and offer to buy a few rounds of Primus in exchange for a couple of their best pics. Rwanda is a MasterCard only country, but the park does not take credit or debit cards or any kind. US dollars are king. If you do pay in Rwandan Shillings, there’s an additional fee. Outside of Kigali (the capital), scoring USD is almost impossible, so come with cash in hand. For another Matador community blog on Rwanda, check out Eva Holland’s Shake Hands With The Devil.